Step 1. Cook the onions and garlic in a pan with the Yorkshire rapeseed oil on a medium heat until the onions are very lightly brown and soft (approximately 8-10 mins). Step 2. Add the chopped leeks and the vegetable stock cube and stir well. Step 3. Add the 2 pints of water and bring to the boil. Simmer for 12-15 mins. Step 4. Add the Yorkshire Cheddar and allow to melt into the soup. Remove from the heat and blend until smooth. 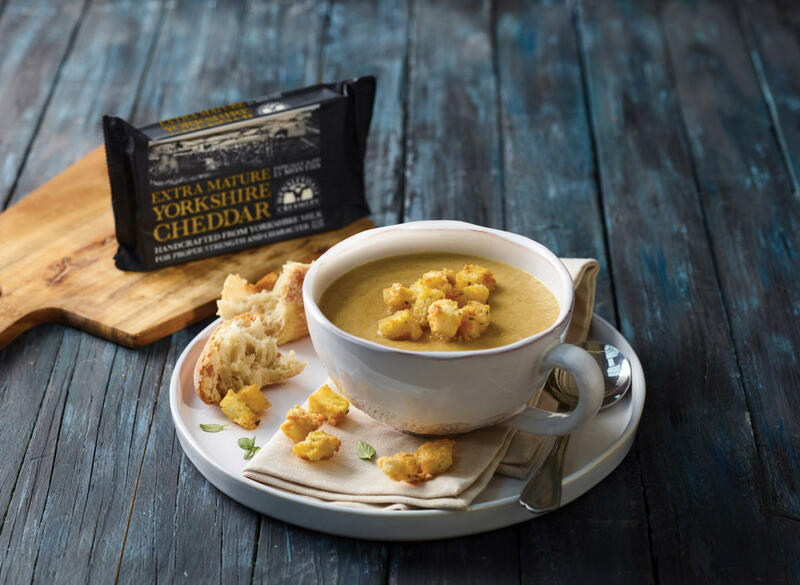 Serve with our crispy Yorkshire Cheddar croutons for the ultimate cheese soup! Looks absolutely delicious, I can’t wait to make this. Thanks for the recipe. Cheese and Onion Soup sounds an ideal choice for a cold day, bring it on!